BMX has been an extreme sport for over forty years and has attracted millions of participants who in turn have devised tracks, tricks and bikes specifically for the sport. Finding the right bike that balances the desires of price, quality and performance requires knowing what makes a bicycle good in the first place and also knowing specifically what you want out of the bike. Failure to know these concepts can lead to a bad experience. While recently perusing the various types of BMX bikes available by leading manufacturers, there was one that caught our eye: The Mongoose Raid BMX Bike. Mongoose is one of the predominant BMX bike makers in the world and has earned its reputation by crafting reliable products. The company started out of a garage in 1974 at the heart of where BMX riding began and has since managed to innovate and dictate the direction of the BMX experience. Mongoose BMX bikes have an aura about them that screams quality but in order to know for sure, a further investigation of the bike’s basics is required. Through the examination of the bike’s specifications, pros and cons, an independent assertion can be made in regards to the overall quality of the bike. The versatility of the Mongoose Raid BMX Bike is the first strong-suit that comes to mind. Thanks to the oversized frame, the bike can handle tough jumps on the dirt and tricks while also being a decent street rider. Most Mongoose BMX bikes perform well in this area, but the Raid BMX bike also has excellent braking power thanks to the two sets of front and rear alloy brakes. The freestyle pegs that come with the bike (four in all) allow for grinding and other tricks to be performed. There are a couple of downsides to the bike that take away from its advantages. Unlike most Mongoose BMX bikes, there have been several reports of the pedals not fitting properly into the pre-drilled holes upon assembly, causing frustration and inconvenience for some buyers right out of the box. The metal pedals are very sharp and can cause injury if your leg comes into contact with them at high speed or after a fall. Assembly is also rather difficult as the bike has to be completely assembled from scratch; no partial-assembly included for this model. 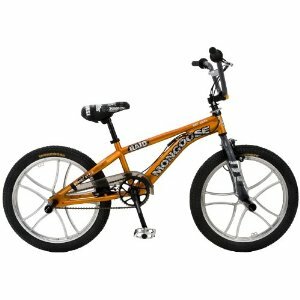 The Mongoose Raid BMX Bike is a great buy for young riders and beginners and with an entry level price of under $170, does not cost much more than traditional bikes. As far as Mongoose BMX bikes go, this is a fantastic beginner’s choice and solid enough considering the price. Finding such a decent bike by a quality manufacturer for this price will be a difficult task; if you or someone you know has been considering this bike for all-around use, we recommend giving it a try. This entry was posted in Bikes, BMX, Mongoose, Reviews and tagged BMX Bike, Mongoose. Bookmark the permalink.